Missing pieces: freedom, truth, and education. Truth is the foundation for prosperity and success. All success. Whether it’s music, mining, mentoring, or mathematics, the degree to which we honor truth will determine the success or failure of the operation. It’s like the two trees below. Imagine the tree on the left is watered with kerosene and fertilized with salt. That’s not a “true” environment for a tree, and the result is certain death. 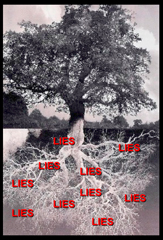 But the second tree grows in an environment of truth, watered by the rain, and fertilized with compost and nitrogen. 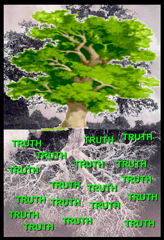 Truth invariably produces life, and anything short of truth results in death and decay. God has not left us wondering about truth, but has revealed it plainly in His word, His world, and His Son. And though Truth is intended to be the focus of education, it has sadly been relegated to secondary status behind information, opinion, and power. We’ll pursue some of the problems and possibilities next post. On a personal note, I went to see Alice in Wonderland last night and caught myself spontaneously cheering at some of the Kingdom moments. (I just can’t help it. Kingdom Truth makes me happy.) “Sometimes, (Alice said), I’ve believed as many as six impossible things before breakfast.” All Truth is God’s truth, even in Wonderland.